All About the Drinks Reception. an important part of the big day. time for a tipple. The drinks reception is an important part of your big day. After your ceremony has been completed, the confetti has been thrown and a group photo been taken (on the Old Bridge perhaps? ), you and your guests move into your drinks reception area. We have a good choice of different reception drinks. Maybe a sparkling perry or cider? Or classic fruity pimms? Or a wheelbarrow full of bottled beers and ice? Or even cocktails in jugs? You can choose one, or you can choose two and have a 50/50 split. Sparkling elderflower or orange juice are good non-alcoholic options for adults and don’t worry about the kiddies – we will make jugs of squash for them at no charge to you! At the drinks reception, many bride and grooms choose to offer their guests canapes, yummy little mini-bites to line tummies in between the ceremony and the main meal. Click on the links below to see our reception drinks list and the canapes choice list. Please choose five canapes from the list. River Maiden Wedding: Your drinks reception area is the Wye Terrace Balcony. Starry Sweethearts Wedding: your drinks reception area is Sweethearts Terrace Lawns. Koffie Pot Wedding: your drinks reception area is the Riverside Courtyard. 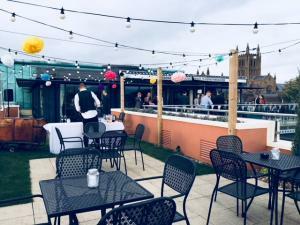 The areas above are what are offered to you for your drinks reception as part of the reception venue hire, however, if you really want to treat you and your guests, you can hire the whole of the Charles’s Bar and Sweethearts Terrace for your drinks reception. This really is an amazing option, so do ask us more about it! Get things flowing with an arrival drink or two for each of your guests. Maybe a sparkling perry or cider? Or a wheelbarrow full of bottled beers and ice? Or some classic bubbly? Or even cocktails in jugs? Here is our Reception Drinks. We also offer a truly outstanding canape menu. Maybe you feel like some quintessentially British canapes such as mature roast beef in a mini-yorkshire pudding or cucumber cups filled with smoked salmon and cream cheese or maybe you’d prefer something more exotic like sautéed tiger prawns or thai spiced crab cakes? ♣ Here is our classic Canapes Menu. £7.80 per person. ♣ Or if you want to quirk it up a bit, try our NEW Pizza Canapes. Dinky Pizza with a variety of toppings. £6.50 per person. ♣ Or if you want to keep it simple and down-to-earth, go for our Welsh Cakes. £4 per person.